Background: Facial wrinkles develop over the natural aging process. The demand to treat these wrinkles is increasing. Several treatment options are available. Objectives: We aimed to investigate the effect of fat injection and its combination with platelet-rich plasma (PRP) on facial wrinkles. Patients and Methods: We recruited 28 patients who were candidates for the treatment of facial wrinkles in this study. Wrinkles were recorded in five areas using standard digital photographs. These areas include nasolabial fold (NL), mouth corners (MC), perioral line (PL), chin (Ch), and marionette line (Mar). Patients were randomly allocated to two groups of 14. The first group received fat injection and the second one received Fat-PRP injection. For this purpose, 15 to 20 mL of fat was harvested from the thigh or abdomen; PRP was driven from blood, centrifuged, and mixed with fat before injection. Patients were followed up at the third and sixth months posttreatment. Wrinkles were evaluated with Wrinkle Assessment Scale (WAS) Index and level of satisfaction was determined on a scale of five. Results: In comparison to their initial condition, both groups showed improvement in wrinkles. NL wrinkles were reduced significantly in the second group compared to the first group (P < 0.001). The two groups were not different in reduction of MC, PL, and Ch wrinkles (P > 0.05). At the third-month follow-up, Mar wrinkles were more significantly improved in the first group (P < 0.02); however, the results were the same in both groups for Mar wrinkles at the sixth month follow-up. Patients of the first and second groups were more satisfied at the third and the sixth month, respectively; however, this difference did not reach a significant level (P > 0.05). Conclusions: Although PRP preparation of fat was found to be superior to fat in the treatment of facial wrinkles in some areas, further studies are required to better delineate this difference. Over the natural and inevitable process of aging, some changes happen in the face that include increase in wrinkles, loss of subcutaneous fat, loss of dermal collagen and elastin, increase in skin laxity, development of deep nasolabial folds, drooping mouth corners, and thinning of lips (1, 2). Treatment of wrinkles is one of the main reasons of visits to surgeons, performing rejuvenation procedures, and the importance of increasing the volume of soft tissue is widely appreciated (3). The first autologous fat transfer surgery was performed by Neuber in 1893 (4). In the past 20 years, with an increasing demand for cosmetic surgery, fat injections regained popularity for the volume loss replacement. A major drawback of this method is resorption of fat over time (5). Consequently, improving the fat grafts' survival time is an important issue. Repeating fat injections is widely practiced (6), which increases patient dissatisfaction because of additional costs and distrust towards the treatment (7). Platelet-rich plasma (PRP) is a recognized blood-derived substance and is being studied in several in vitro and in vivo projects, yet, the observations have been controversial (8-10). PRP accelerates hard and soft tissues healing, particularly, its effect in chronic ulcers is confirmed in human, (11, 12). It has been suggested that different factor from the platelets may contribute to the inconsistency in observations, which include interleukin 1 (IL-1), transforming growth factor β (TGF-β), vascular endothelial growth factor (VEGF), platelet-derived growth factor (PDAF), endothelial growth factor (EGF), insulin-like growth factor (IGF), vitronectin, fibrinogen, and fibronectin (13). Thus far, the efficacy of mixed PRP and fat is an open question (13, 14). Hence, we aimed to evaluate the effect of fat on improving facial rejuvenation and patient satisfaction in comparison with mixed fat and PRP (fat-PRP). In this randomized double-blinded clinical trial, patients who aged < 65 years old who complained about facial wrinkles were recruited from June 2012 through August 2013. Patients with smoking history, uncontrolled systemic disease, and aspirin therapy were excluded. Wrinkles were assessed using the Wrinkle Assessment Scale (WAS) Index (Table 1) and patient satisfaction was expressed on a scale of five (Table 2) (15, 16). A total of 28 patients (24 females and 4 males) were randomly allocated the following groups: Group 1 only received fat injection and group 2 received injection of fat-PRP. 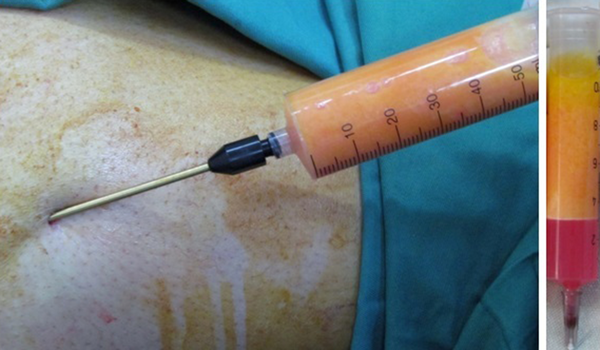 After deep sedation or general anesthesia, 15 to 20 mL of fat was harvest with a 6-mL cannula from the abdomen or upper lateral thigh by injecting a tumescent solution (100 mL of 0.9% saline, 10 mL of 2% lidocaine, and 0.2 mL of epinephrine). Centrifugation was completed at 1000 rpm for one minute (Figure 1). If the quality of fat was low or it was not mixed with the blood, the centrifugation steps would be bypassed and fat would be purified manually. A commercially available material named RooyaGen (Tehran, Iran) was used to prepare PRP. Under aseptic conditions, a 35-mL sample from the brachial artery was collected in a tube, containing 5 mL of anticoagulant citrate, and was distributed in aliquots of 10 mL into four sets of tubes. These tubes were centrifuged under sterile conditions at 1700 rpm for 12 minutes to separate platelet-poor plasma and Buffy coat into two other tubes. These tubes were further centrifuged at 3500 rpm for seven minutes (Figure 2). PRP and fat were mixed in a ratio of 1:10 and injected with a 2.6-mL cannula. The injected areas were nasolabial fold (NL), mouth corners (MC), perioral line (PL), chin (Ch), and marionette line (Mar). Fat and PRP preparation was fulfilled by a trained assistant and all injections were performed by a trained and experienced surgeon. The preoperative and postoperative assessments included clinical examination, taking standard photographs, and completion of patient satisfaction questionnaire. Postoperative follow-up took place at the third and sixth months (Figures 3 and 4). The Ethics Committee of Azad University approved this study. Following full explanation of the procedures and follow-up visit requirements, all patients signed a written informed consent. The results were expressed as mean ± standard deviation (SD). Due to considerable variation of WAS Index in different areas, statistical analysis was performed on changes of the rate using non-parametric Mann-Whitney U test. P < 0.05 was considered statistically significant. The two groups were not different in terms of socioeconomic status, age (mean ± SD, 38 ± 11.6 years), use of cosmetics, and initial satisfaction (median, 4). Table 3 summarizes the initial WAS and the changes at the third and sixth months of follow-up. Improvement in NL and Ch wrinkles was higher at both follow-up sessions in patients receiving Fat-PRP (group 2) but only NL changes reached a statistically significant level (P < 0.001). At the third month of follow-up, patients receiving fat (group 1) showed higher improvements in Mar, MC, and PL wrinkles but only Mar changes reached a statistically significant level (P < 0.02); nonetheless, no statistically significant improvement was observed at the sixth month follow-up (P > 0.05). aAbbreviations: NL, nasolabial; MC, mouth corners; PL, perioral line; Ch, chin; Mar; marionette line; PRP, platelet-rich plasma. 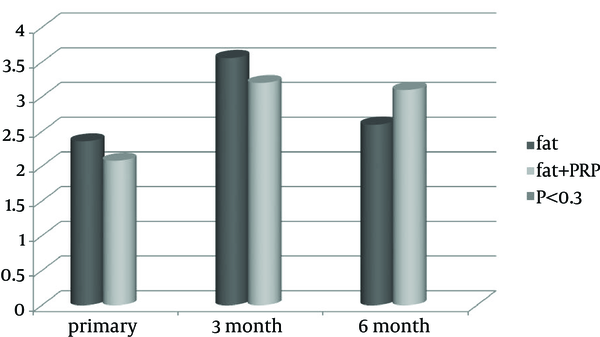 Initial patient satisfaction together with third and sixth months follow-up results are shown in Figure 5. Patient satisfaction was higher in the first group at the third month of follow-up and it was higher in the second group at the sixth month of follow-up; however, none of them reached a statistically significant level (P < 0.3). This study was among very few studies that compared the outcome of fat vs. Fat-PRP injection for the treatment of facial wrinkles. We observed relative improvement in some areas. Unpredictable results in fat graft survival had led to ample clinical and animal studies on harvesting methods, preparation, donor sites, and additives to the fat; however, no consensus has been reached on the appropriate method (6, 7). PRP is a blood-derived substance and has been studied in several in vitro and in vivo projects with the contradictory observations (8-10). Tamimi et al. compares two methods of PRP preparation, namely, the Nahita system single centrifugation and the ACE double centrifugation. They concluded that although ACE method was able to achieve higher platelet concentration, it made the PRP more prone to small errors during preparation (17). This observation was reproduced by Nagata et al. (18). Por et al. harvested fat grafts and PRP through Colman technique and Magellan system, respectively. They compared the histologic features and could not identify any significant difference. Therefore, they concluded that PRP does not enhance fat graft survival (19). We followed instructions from the commercialized product of RooyaGen kit (Tehran, Iran) for preparing PRP. Khater et al. compared the preparation of fat grafting by single centrifugation at 3400 rpm for three minutes with serum lavage without centrifugation, and found better survival of fat with serum lavage (20). Cervelli et al. prepared the PRP with Cascade-Esforax system and harvested fat tissue from the abdomen, which was processed for three minutes at 3000 rpm. They found that PRP improved the function of fat graft in plastic reconstructive surgery (14). Ferraro et al. compared three centrifugal forces of 3000, 1300, and 500 rpm in vitro and found that 1300 rpm ends in acceptable cell viability, which was also observed in clinical practice (21). According to their findings, we processed the fat for one minute at 1000 rpm or prepared it manually as an attempt to decrease cell destruction. Sadati et al. harvested the abdominal fat with the Smart Prep Harvest Technologies and mixed it with PRP in a ratio of 9:1. They injected the mixture into the cheek, vermillion, nasolabial fold, chin, extremities, and trunk. Their results supported the superiority of Fat-PRP for rejuvenation (16). They did not explained their measurement techniques; however, the recipient sites with active and strong muscles, as in our study, are known to affects the durability of the graft (5). Cervelli et al. treated 15 patients for volume and elasticity loss with centrifuged fat mixed with PRP. They had photographic postoperative follow-ups after three, six, and 12 months. By the end of their study, they supported the positive effect of Fat-PRP on graft survival (13). In another study, Meier et al transferred the fat to the mid-face of 66 patients and followed them with a Canfield Scientific Vectra camera, enabling three-dimensional (3D) imaging, which rendered quantitative measurements possible. They found 32% remaining fat after 16 months (22). Cervelli et al. 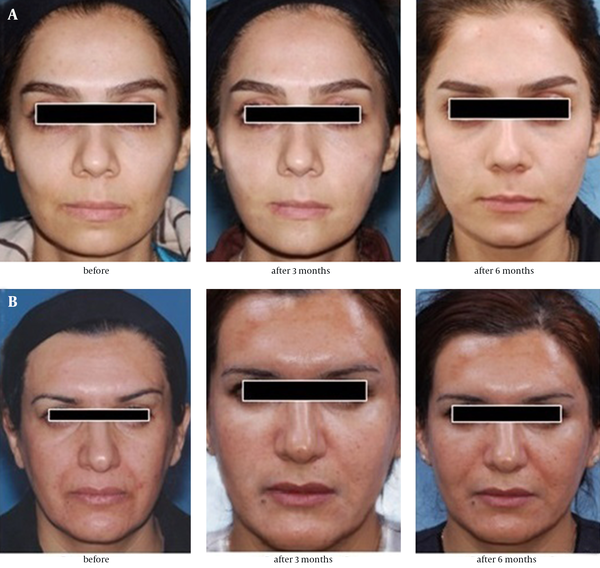 had performed the full-face fat injection mixed with platelet gel in two patients with hemi-facial atrophy. The postoperative follow-up evaluation took place at the second and fifth weeks as well as third, sixth, and twelfth months using comparison of photographic data and 3D computed tomography. Ultimately, their results supported the efficacy of the treatment (23). We converted qualitative measurements to quantitative values using the sample images although 3D imaging could increase the accuracy of measurements. Rusciani et al. 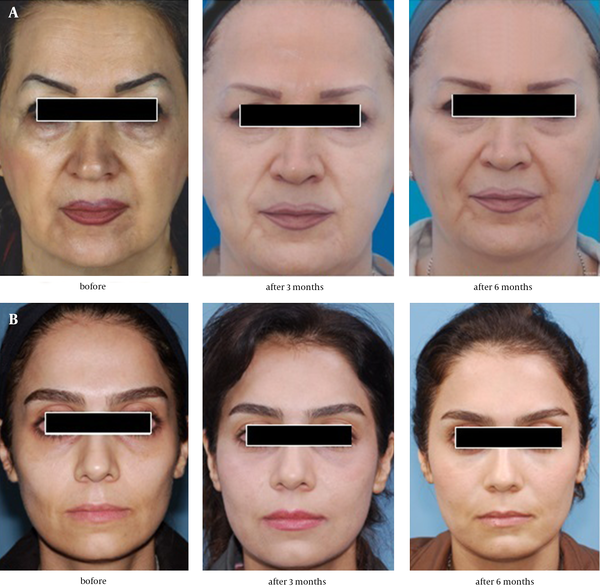 had rejuvenated the face of 215 patients using fat transfer and saline washing and had postoperative follow-ups after one month and one year with five photographs (Frontal, Right oblique, Left oblique, Right profile, Left profile). Finally, 85% were satisfied with their treatment (24). We followed our patients with one photographic view although evaluation using five different view of the face would add to the accuracy of the study. Keyhan et al. compared PRP with PRF on fat survival in 25 patients. They injected half of the face with PRP and the other half with PRF and by the comparison of the photographs, they reported the superiority of the PRF (25). Using two different kind of material in one person is not ethical. As we mentioned, one of limitations to our study was the wide variability in WAS Index in different regions. This might be stemming from the available fat tissue, quality of the harvested fat, and anatomical point of interest. To overcome this limitation, we did the statistical analysis using Mann-Whitney U test, which included the changes of the rate. Our study partially supports the superiority of Fat-PRP preparation over the fat preparation in the treatment of facial wrinkles. Further investigations in the form of larger and ideally multicentric trials are required to draw better clinical conclusions. Authors would like to appreciate the Department of the Oral and Maxillofacial Surgery of Buali Hospital, Azad University, Tehran, Iran. Authors’ Contributions: All authors contributed in gathering data and drafting the paper. Farzin Sarkarat and Zahra Malekpour performed all the surgical procedures.